Eyebrows have firmly established themselves over the past several years, both in the beauty market but also on everyone’s face! Thick, well-groomed, what can only be described as statuesque brows are claiming their stake on people’s faces all across the U.S. and abroad. While many of us know what a good brow looks like, we’re not so sure of how to get it. In the past three years or so, new brow products have sprouted up from brands that run the gamut, and the inevitable question is… do I really need all of this to get the perfect brows? Ladies and gents, the answer is a resounding NO. There are a slew of products out there simply because everyone’s eyebrows are different. Some of us are born with great shape and density but just want to tame them a bit. Others are sporting super thin brows that haven’t recovered from the 90’s and need a bit more resuscitation. These two types of brows won’t need the same products because they have very different needs. So, first things first, think about what your brows NEED in order to get the desired effect you WANT. Once you get over this hurdle, purchasing the right product or products for your brows will be a whole lot easier. Here’s a general guide to products and their benefits to help in your product selection. The latest brow trends show super defined brows that might look nice on Instagram but can be a bit dramatic in real life. To define the shape or you natural brows, or add length/width to skinny brows, you can use a pencil. If you use a pencil, use short, small strokes to define your eyebrows’ edges. While you can be more heavy-handed on the tail-end of your brow, try not to add too much pencil to the start of your brow. It’ll make it look too clownish and artificial. Powders are great because they’re quick and easy, but they’re really only good if you already have great brow shape that are only a tad sparse. 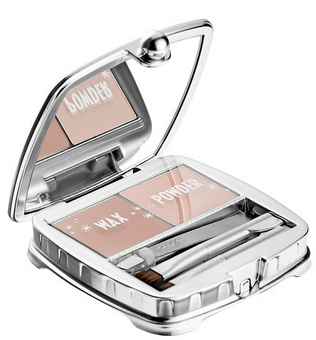 If your brows are seriously lacking in shape or density, powder ain’t gonna cut it. Pro Tip: To make powder stay on longer and take on a more defined shape, use a clear brow wax (comes in a pencil or with a brush and a pot). Apply to brow before powder to help the powder stick better, and you can even apply some wax on top of the powder to help lock it in. Pomades and gels can also add great definition but definitely take some practice. Use a small, angled brush to lightly apply the pomade in similar short strokes along your brow. A little goes a LONG way, so be careful. Use the back of your hand to wipe off excess product, whether it be a pomade in a pot or a gel that comes out of a squeeze tube. Your hands will get messy. #DealWithIt. Just like with a pencil, you can be more defined on the latter half of your brow, but be sparing and gentle when applying to the start of your brow (closer to the bridge of your nose). Pro Tip: Run a spoolie brush through your brows after applying your product to distribute the pigment and soften the strokes you drew in. So there you go! 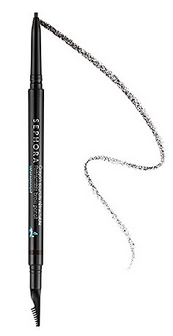 Now you know how to triage your brow issues and only buy what products are right for you. Good for your face AND your bank account. Brow products have gotten seriously OUT OF HAND. Benefit is the worst of them all. No one needs ALL of their offering, it’s nuts! It’s so overwhelming! I know it took me a while to figure out what worked for my brow needs, skin type, and desired look.